JERUSALEM (CNN) -- Recent media reports about the negotiations to secure the release of a kidnapped Israeli soldier are "exaggerated and damaging," outgoing Israeli Prime Minister Ehud Olmert said Sunday. A portrait of Gilad Shalit is held during a protest demanding his release in Tel Aviv, Israel, in January. "This complex and sensitive process requires due caution regarding all that is said," Olmert said at the start of his weekly Cabinet session. "When there is something to inform the public, I will do so. 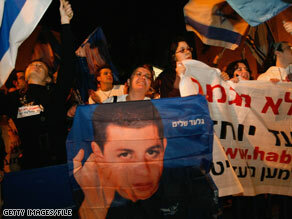 It is clear that we all hope that the day when Gilad Shalit returns to his family will come as soon as possible. We will not slacken in our efforts to achieve this." Shalit was 19 when he was captured on June 25, 2006, by Palestinian militants in Gaza, including those from Hamas, which now controls the territory. The militants tunneled into Israel and attacked an Israeli army outpost near the Gaza-Israel-Egypt border, killing two other soldiers. Israel immediately launched a military incursion into Gaza to rescue him, but failed. Olmert has been under pressure to secure Shalit's release as part of a broader cease-fire deal with Gaza's Hamas leadership. Israel in January halted a three-week military operation in Gaza under a cease-fire that did not include Shalit's release as a condition. A leading pan-Arab newspaper, Al-Hayat, reported Sunday that Israel has agreed to release 1,000 prisoners -- including jailed Fatah leader Marwan Barghouti -- in exchange for Shalit, according to an Israeli daily, Haaretz. But Hamas officials told Haaretz there have been no new developments in negotiations regarding Shalit. In the past, Hamas leaders have asked for Barghouti's release in exchange for the kidnapped Israeli soldier. Barghouti is serving five life sentences after being convicted in 2004 on five counts of murder stemming from three al-Aqsa Martyrs Brigades attacks that killed Israelis. He was also sentenced to 40 years in prison on an attempted murder charge from a failed suicide car bomb.